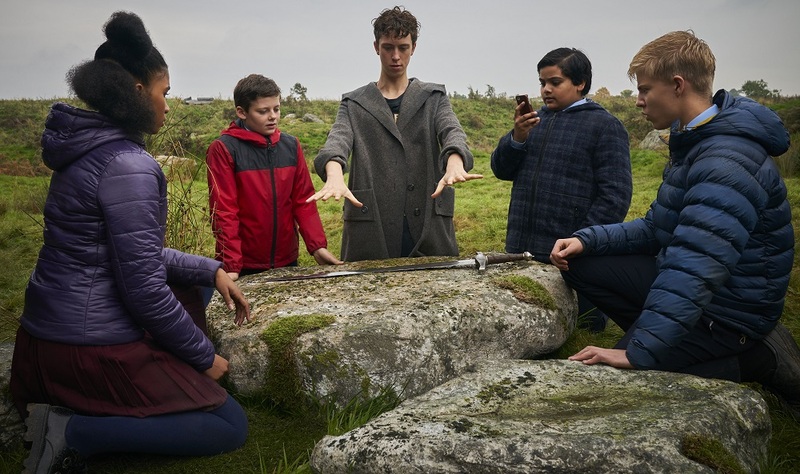 After he is chased into an abandoned construction site walking home from school, ordinary everyday schoolkid Alex (Louis Ashbourne Serkis) stumbles upon a sword embedded in a stone slab. Pulling it free, the next day he jokes with best friend and confidant Bedders (Dean Chaumoo) that it must be the ancient weapon Excalibur. Of course, if it was Excalibur that would make Alex the once and future king of Great Britain. It would also mean that all of those stories of King Arthur and his Knights of the Round Table had to have been true as well, and that figures like Sir Lancelot, the wizard Merlin and the evil sorceress Morgana were more than figments of a variety of famous authors’ collective imaginations. Yet the sword is Excalibur. It has chosen him to lead a fight against unimaginable evil. The wizard Merlin (Patrick Stewart), masquerading as a fellow student (Angus Imrie) at Alex’s school, urges the boy to embrace his destiny but also warns him that Morgana (Rebecca Ferguson), far from a fictional creation, will do whatever she can to destroy him in an attempt to get her hands on Excalibur. 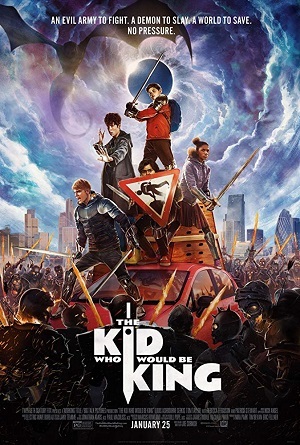 It’s an epic adventure, one where this young boy will discover things about himself, his friend Bedders, his protective mother Mary (Denise Gough) and former enemies turned trusted allies Lance (Tom Taylor) and Kaye (Rhianna Dorris) he never knew possible. Most of all, Alex will learn that there’s more to being a leader than talking tough or carrying a magical sword, and if he isn’t honest and forthright no amount of courage will allow him to ever find the strength to defeat Morgana. It’s been eight years since writer/director Joe Cornish made his stunningly spectacular R-rated debut with the rambunctiously crowd-pleasing Attack the Block and in the process made instant sensations of future Star Wars star John Boyega and current Doctor Who Jodie Whittaker. In the years since he helped Edgar Wright come up with the initial story and script for 2015’s Ant-Man while also co-writing the screenplay for Steven Spielberg’s The Adventures of Tintin. He also appears in an uncredited cameo as a Resistance fighter in Star Wars: The Last Jedi. Other than that? Sadly there’s not a lot to talk about, the talented filmmaker unable to get funding for a variety of projects even though his debut became an instant cult phenomenon that some feel isn’t just terrific, but also happens to be one of the best films of the decade. Cornish’s far more family-friendly Arthurian legend reinterpretation The Kid Who Would Be King was worth the wait. This movie is a divine joy that treats both its characters as well as its audience with respect, this fiendishly entertaining fantasy-adventure overflowing in intelligence, imagination and wit that’s as infectious as it is exhilarating. Perfect fodder for viewers of all ages, genders and races, this is a story that lives up to the classic legend that inspired it, Cornish achieving the near impossible as he crafts a kid-friendly update that maintains respect for the source material even as it modernizes it in some fairly radical ways. What’s interesting is just how much emotional weight the filmmaker injects straight into the heart of Alex’s story. The youngster is obsessed with learning about his father, even coming to believe that the reason Excalibur came to him must have something to do with the man’s disappearance not too long after his birth. There is an authentic give-and-take between Alex and Mary that craftily ponders a plethora of weighty topics, mother and son finding ways to learn from one another that are free of artifice and subterfuge, truth becoming their most effective weapon to combat potentially lethal combinations of fear and distrust that are conspiring to do them both harm. Additionally, much like Spider-Man: Into the Spider-Verse and Star Wars: The Last Jedi this tale finds compelling ways to remind viewers heroes come in all shapes and sizes, a person’s background, genealogy or lineage completely unimportant, the size of an individual’’s heart and the selfless purity of their actions all that truly matters. At just about two hours in length the film can feel a little long, and there are some portions during the middle where I thought Cornish was unnecessarily repeating a few of his expositional plot points. Stewart, as much fun as he appears to be having as the elder incarnation of Merlin, is somewhat underutilized, while an entire suspense sequence taking place in Morgana’s underground lair is oddly inert as I personally found it obvious this was not a climactic encounter between hero and villain but instead was only a precursor for the bigger battle still to come. 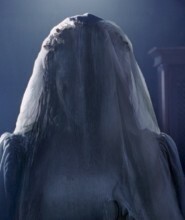 But Ferguson is exquisite as the evil sorceress, the talented Mission: Impossible – Fallout and The Greatest Showman actress gleefully reveling in her character’s wicked ways with infectious relish. Chaumoo steals scenes left and right as Alex’s unapologetically candid best friend, while Imrie is a goofily eccentric hoot as the younger Merlin. Best of all might be Dorris as Kaye, her performance a sly mixture of timid uncertainty and defiant self-confidence that allows her character to grow in resonance as events progress to their suitably rowdy conclusion. I loved her in this, a sequence featuring Kaye showcasing unimagined skills behind the wheel of a car as she, Alex, Bedders and Lance outrace demonic knights intent on their dismemberment planting a giant smile on my face that would remain there for the remainder of the motion picture. Young Serkis, son of The Lord of the Rings and War for the Planet of the Apes star Andy Serkis, is wonderful in the title role, the young actor exhibiting a mesmeric talent for emotional variance that’s delightful. He jumps from comedy to drama with ease, and the naturalistic chemistry between him and Chaumoo is simply marvelous. But it are the scenes between Serkis and Gough that hit home the most, a quiet bit near the end involving them splitting my heart into a number of teeny tiny pieces that only made the events of the climax hit home with that much more invigorating authority. All of which makes it no surprise that, even with a couple minor hiccups here and there, I ended up enjoying Cornish’s sophomore outing one heck of a lot. The Kid Who Would Be King is a total blast, this Arthurian tale of thrilling daring-do and noble valor a royal success worth taking the entire family to the theatre to see.